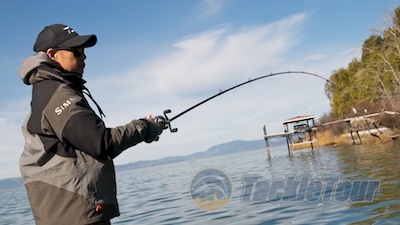 Naturally, here at TackleTour, we're all about the tackle. So in our brief time with this rig, which rods and reels have we found appropriate to throw it? Well, this goes back, again, to how you actually configure your umbrella rig. We're fortunate enough to have, right in our area, one of those vanishing commodities, a neighborhood tackle shop. Properly leveraged, assuming they fish the product, the purveyors at your local tackle shops can shorten your learning curve with just about any bait or technique. 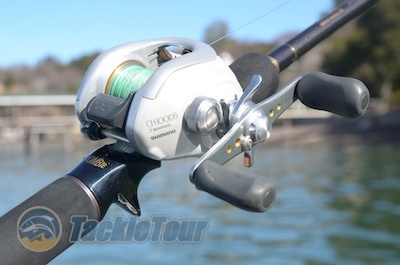 Dean Yoshizumi of Hi's Tackle Box shared with us his on the water experience with this rig. Dean Yoshizumi and Jonah Li of Hi's Tackle Box in South San Francisco have performed extensive research on this rig, discussed rigging options with their prostaff, and more importantly, have spent time on the water perfecting their own recommendations on how to fish it. 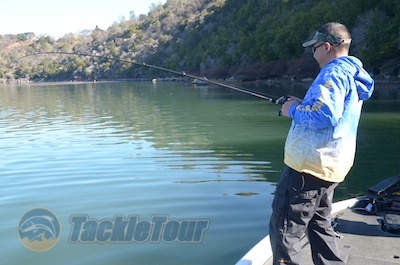 Our first stop in gearing up for this article was at Hi's Tackle Box. Zander's combo of choice while fishing the umbrella rig, a Zombie Rod matched with a Chronarch D.
In California, our regulations allow three hooked baits on an umbrella rig. 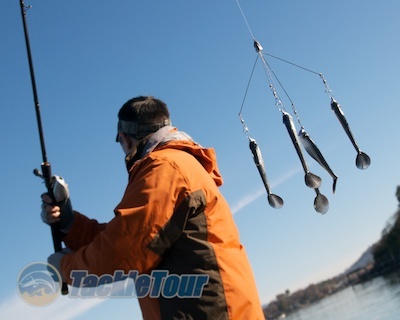 If using a five armed rig, this means two out of the five arms must have decoy baits attached (i.e. baits with no hooks). The easiest way to accomplish this is to take a jighead, cut off the hook, and then slide your swimbait body onto it. Since there's no hook to keep it in place, you might want to use some softbait or crazy glue to secure your bait to the jighead. Spooled on his Chronarch D is hollow braid with a 20lb fluorocarbon topshot. You can experiment to see where these decoys will be most effective, but we used 4” baits and put them on light jigheads (approx 1/8 oz) at the top of the spread. Then, at the bottom, we used the same size swimbait bodies but attached to 1/4 oz jigheads hooks intact. So we were running a total of one quarter ounce on top, and half a ounce on the bottom. This difference of one quarter ounce was enough to keep our rig upright in the water with no problems of spinning. Cal's choice? Enthusiast all the way... Megabass's Black Python and LIN 10 combo. On the middle arm of our spread, Hi's suggested a five inch bait, so in order to accommodate the larger bait, we had to go up in size on the jigheads to take advantage of the larger hooks. On the middle arm, we had a three eighths ounce head with a 5/0 hook. Spooled with 19lb Sunline Defier Mono. The rig we performed most of our fishing experimentation with was the Swarmbrella so the total weight of our rig for casting purposes, taking into consideration the weight of the swimbait bodies too, was just over two ounces. So you see, even with relatively light jigheads, the total weight of the rig is pretty high. 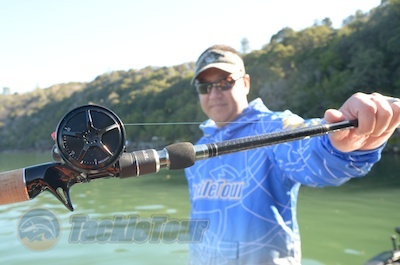 Dean casting the rig with his Crazy Cranker and Steez XBD Frog Rod. 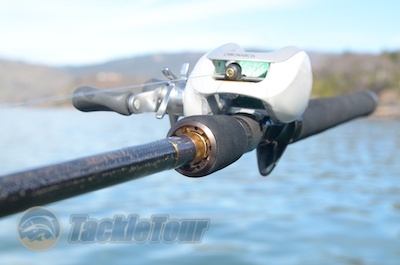 The Tackle: Rods that we used during our field tests with these rig include the Daiwa Steez STZ741XHFBA-XBD Frog Rod, Zombie Rod 7’10” Flip Pitch Cast, Kistler ZBone ZBLE-5H, Megabass FX-81X4 Black Python, and Evergreen International’s TKLC-77XXHX Wild Stallion Valliant. 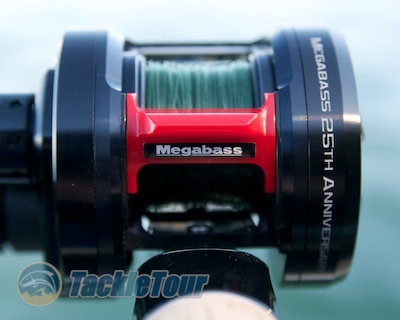 Reels ranged from Daiwa Zillion Crazy Cranker to the Chronarch D5 to the Daiwa Ryoga 1016L to the limited edition Megabass LIN 10. Line recommendations for throwing an umbrella rig is a high quality mono. We used mostly Sunline Super Natural and Sunline Defier in 20 and 19 pound test, but Zander was using a hollow braid top shot with 20 pound fluorocarbon spooled by Hi's Tackle Box. Zander gettin' ready to have at it. Casting: With a total lure weight of just over two ounces, our configuration of the umbrella rig was akin to casting a swimbait, albeit a very large and unwieldy swimbait. Make no mistake about it, there is so much going on with this rig as it flies through the air that it is prone to fouling if you're not careful. The most common tangle is for your line to loop over one of the arms so that your line ends up pulling from behind the head instead of the line tie. The best way to mitigate against this occurrence is to stop your spool short of the bait hitting the water to restore tension in the line. This will snap the umbrella rig around and ensure the head is pointed towards you on splash down. Then it's a matter of counting the bait down to your desired fishing depth.